US student Otto Warmbier has been freed from jail in North Korea, but his parents say he has been in a coma for a year. The 22-year-old was flown to the US and landed in Ohio late on Tuesday. The Warmbier family told US media they had found out only last week that their son has been in a coma since shortly after his trial in March 2016. Mr Warmbier was sentenced to 15 years of hard labour for attempting to steal a propaganda sign from a hotel. He is being taken by ambulance to the University of Cincinnati Medical Center, US media reported. Otto Warmbier is an economics student from the University of Virginia, originally from Cincinnati, Ohio. 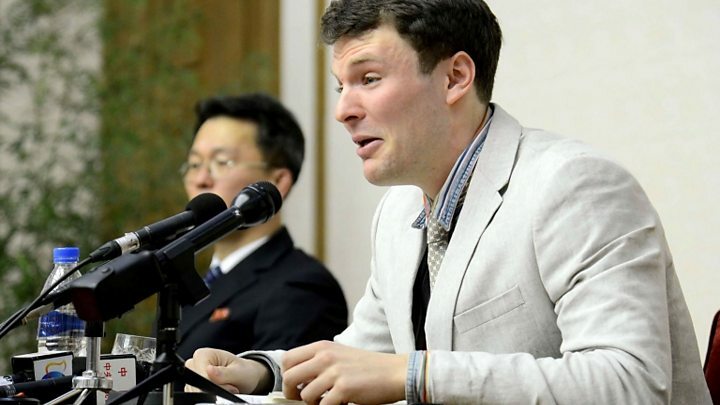 He was in North Korea as a tourist with Young Pioneer Tours when he was arrested on 2 January 2016. He appeared emotional at a news conference a month later, in which he tearfully confessed to trying to take the sign as a “trophy” for a US church, adding “the aim of my task was to harm the motivation and work ethic of the Korean people”. Foreign detainees in North Korea have previously recanted confessions, saying they were made under pressure. After a short trial on 16 March, Mr Warmbier was given a 15-year prison sentence for crimes against the state. His parents Fred and Cindy told CNN in early May that they had had no contact with their son for more than a year. What is his condition now? In a statement, Fred and Cindy said: “Otto has left North Korea. He is on a Medivac flight on his way home. They were quoted by the Washington Post as saying they had been told Otto had contracted botulism, a rare illness that causes paralysis, soon after his trial in March 2016. He was given a sleeping pill and had been in a coma ever since, the newspaper said. Mr Tillerson made no mention of Mr Warmbier’s condition in his statement, saying only that he was on his way home to be reunited with his family and would not make any further comment, out of respect for the privacy of the family. Who else is detained in North Korea? The US has in the past accused North Korea of detaining its citizens to use them as pawns in negotiations over its nuclear weapons programme. The arrests have come at a time of heightened tension between North Korea and the US and its regional neighbours. In other news on Tuesday, South Korea said it had found a North Korean drone that had crashed after taking photos of the US-funded Terminal High-Altitude Area Defense system (Thaad), which aims to protect the South from the North’s missiles. South Korea’s military also reported that a North Korean soldier had defected across the heavily-protected Demilitarized Zone (DMZ), a rare occurrence. Why is Dennis Rodman in Pyonyang? Mr Warmbier’s release comes hours after US basketball star Dennis Rodman arrived in North Korea. Mr Rodman is a friend of North Korean leader Kim Jong-un and has made several visits to the country in recent years. There was some speculation that he might plead the case for the American detainees, but en route to North Korea he told reporters “my purpose is to actually see if I can keep bringing sports to North Korea”. He also said “I’m just trying to open the door”, and added that he was “pretty much sure that [US President Trump] is happy with the fact that I am over here trying to accomplish something that we both need”. ← Who did you nominate for a blue plaque?